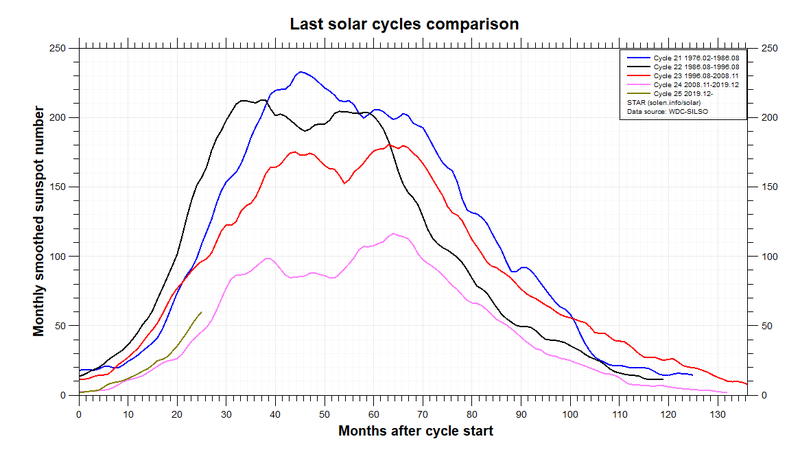 With regards to the forecast for solar cycle 25 there is a link between a longer minimum favouring a weaker amplitude to follow but less of a link between a solar cycle causing a lower minimum to follow so it seems the minimum leads the peak. Since we are 30 months in to our cycle and now somewhere near 400 spotless days we are approaching the time where we will find out if this minimum will be what we dream of. Typically shorter and less deep minima see the sharper fall and then quickly rebound (month 33 is average) with cycles like the last one seeing a slower decent. If in 6 months we are still flatlining then chances are we will smash records given that we are running well ahead of 08. Not being funny, SB: I get the correlation but what makes the link? Cant be certain without actually measuring the gradient, but the current decline does look more gradual than previous cycles, even a bit more gradual than 23. 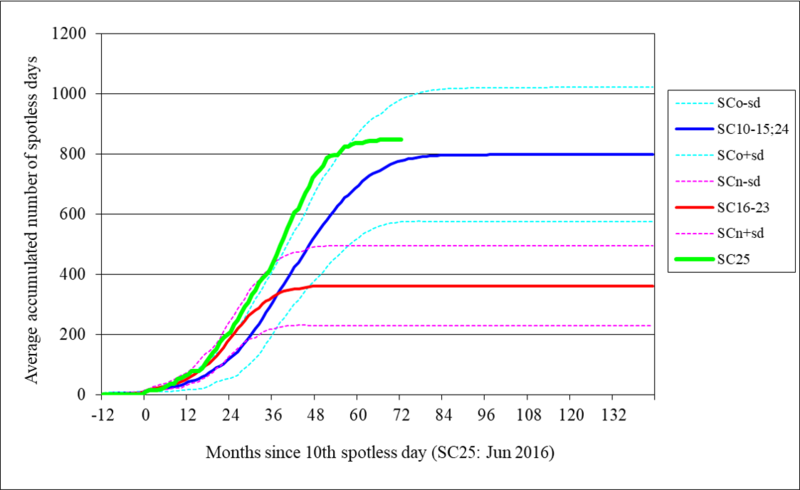 Cycle 23 has a decline of 171 sunspots in 68 months which is 2.5 sunspots per month. Cycles 22 and 21 look far steeper than both. Sunspot AR 2729 producing B class solar flare. Coronal hole 1million km across the equator nearly bisecting the solar disk. Thermosphere Climate Index is reading 3.81 billion watts=cold. Yeah, the gradient does actually look shallower on that chart. It's just that out lower starting spot has put us ahead. With us now in 15th spot for spotless years it will be interesting to see how 2019 and 2020 challenge the top years. .. Guys, if we only took the data for Q3 this year then what percentage of spotless days were there (and Q4 so far). The Boulder count will be higher because - for whatever reason - they have counted more spotless days this cycle (340 versus 308 for SILSO). I'd caution against using simple extrapolation. Remember there are two physical processes (albeit connected) in progress: the winding down of SC24 characterised by sunspot activity around the Sun's equator and SC25 starting up characterised by high latitude spots (or just active areas) with reversed polarity. In recent weeks, we had two SC25 active areas in the space of a few days. Sunspot ar2729 has a strong stable magnetic field which poses no threat for solar flares. Thermosphere climate index...3.88 billion watts=cold. Sunspot ar2729 has a stable magnetic field and poses no threats for solar flares. As of yesterdays update, thermosphere climate index reading 3.67 billion watts, getting closer to that all time record cold set in feb 2009, the modern space age that is. Radio sun 10.7cm flux, 70 sfu. Sorry to be a pedant but is it not 36.7 billion watts? Departing sunspot ar2729 is throwing off minor b class flares. Thermosphere climate index...35.5 billion watts, getting colder. Departing sunspot ar2729 is crackling and throwing minor b class flares. Yep, that pesky spot has ruined my guess of 220 spotless days! Thermosphere climate index 34.4 billion watts=cold. 204 sunspotless days so far 2018. Sunspot ar2730 is small and poses no threat for strong solar flares. Thermosphere climate index=34.4 billion watts=cold. Thermosphere climate index 34.2billion watts=cold.